What’s the best fishing line for trout fishing? Is it mono, otherwise known as the mono-filament fishing line? Is it fluorocarbon fishing line? Or is it braided fishing line? Before I answer these questions, let me tell you something first. You see, this subject of fishing line is a debatable subject. I’ll tell you what works for me. What works for me may not work for you. I urge all my readers not to fight & argue over this. 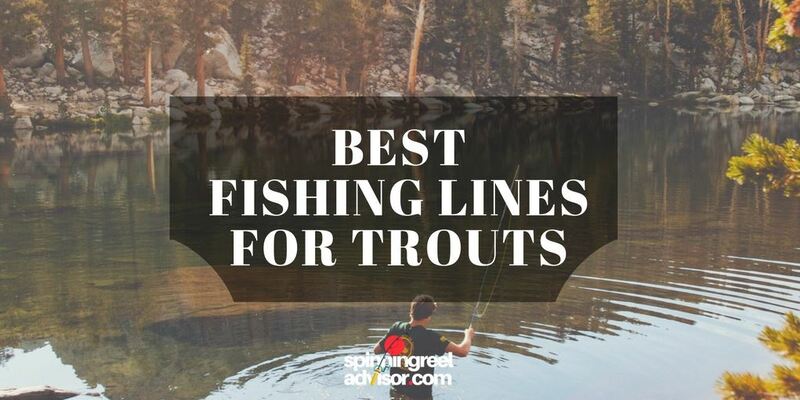 As you can already tell by now, assuming you have visited a lot of sites for this answer, nobody has ever been able to come to a sensible conclusion to which fishing line is best for trout. I’ve spent thousands of hours behind a fishing rod. 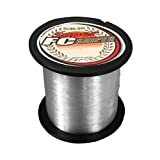 From my experience, I can tell that or I personally prefer fluorocarbon fishing lines to be better than the mono-filament fishing line. Particularly in streams when I’m fishing for trout. I’ll always go with a fluorocarbon line. This is a no-brainer folk! Trout is the most line shy freshwater fish that exists in the water world. I can’t even think of catching a trout with a braided fishing line. That’s why for me, the best trout fishing line is the fluorocarbon fishing line. 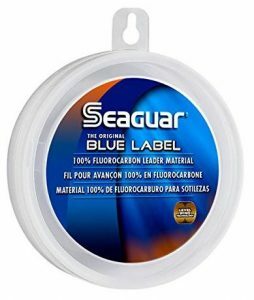 Among the top fishing lines for trout, the Seagure Blue Label Fluorocarbon line has a nearly invisible appearance under water. I’ll use braided fishing lines when I’m not fishing for trout. Say, for example, if I’m going to fish for golden perch, yellow belly fishing or Murray cod fishing, I’ll always use braid. But for trout, I’ll stick with fluorocarbon lines. But, it’s not like I’ll be using the same fishing line for all seasons. There are time & place for each of them. Sticking with a specific type of fishing line won’t do any good. I’ve seen a lot of people use braided lines as their main reel line and for the leader line they use fluorocarbon. Some even have better luck with monofilament lines. If you want to reel in some dandy trout, you need to know about different types of trout fishing lines that are available. 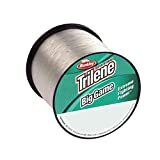 Before I go into the details of all the different types of trout fishing line, have a quick look at some of my personal favorites. (READ MORE: Step-by-step Guide for choosing the best fly fishing vest, best spinning reel for the money and best telescopic fishing rod). Tons of lines out there, but I’m not going to talk about all of them. I’m only going over the ones that you need for trout. Why different types? Why not simply pick one? It’s very important for you to know why and when you need to use one type of over the other. Each type of line has its pros and cons. These lines are pretty much or should I say completely invisible to fish. Trout being very line shy, it’s the best trout line to go for. It is crystal clear and you can feel the bites a lot better. Like monofilament lines, which I going to talk about after this one, fluorocarbon lines don’t stretch much. It’s not really elastic. This is a good thing because you are going to feel the bites a lot quicker. You are also going to have harder hook sets. This line sinks. Use it if you want to get your bait down in the strike zone a little bit better. The downfall of these lines is that they are expensive compared to other lines. Starting out, sometimes you don’t want to spend this much on a fishing line. But, if you want to catch more trout, you need to try these lines for yourself. One of the hardest things to decide before going to fishing trip is fishing lines. You walk into your local retailer or shop online and see a massive collection of lines which will literally make your head spin. Now, for trout fishing as I have mentioned before, your lines should be very clear. Here is a list of Best Fluorocarbon Fishing Line reviews which found pretty darn good for trout fishing. This is the fluorocarbon that started it all. In clear water, the Seaguar Blue Label is my “go to fishing line”. It’s a 100% Fluorocarbon Leader material. It’s got a smaller diameter. It is time-tested and proven to be the best. This is by far the best fishing line for trout. It’s what all the others are measured against. Seaguar is the one who actually invented the fluorocarbon line and leader in 1971. It’s abrasion resistant and has incredible knot strength. It has a good tensile strength and shock absorbency. Because it’s 100% Fluorocarbon, it is virtually invisible under water. It’s the closest to getting near perfect invisibility. Why? Because it has the same refraction index that is very close to water. Mono might look the same outside of the water but as soon as it is in the water, you can see the differences. And don’t get me started about the braid. You can use it for freshwater fishing. But what about saltwater? That’s where it shines the most. It has a great shock absorbency. It can take the abuse. For your next leader line, go with the Seaguar Blue Label 25-Yards Fluorocarbon Leader and see the change for yourself. KastKing Copolymer is already a great line by itself. This stuff has a 100% fluorocarbon coating on the outside. So, what you get is basically all the great attributes that you find in a pure fluorocarbon line at a very reduced price. You can get this stuff for a fraction of the cost of a fluorocarbon. It has a low stretch. It is super abrasion resistance. Just like fluorocarbon it sinks and nearly invisible in the water. If you go for the 8lb line, it will have a very small diameter. 0.23mm to be precise. You can use it different types of situations like moving baits, spinner baits, chatter baits and even crankbaits. It sinks faster than other lines and doesn’t absorb water. Perfect lines for deep water fishing. Normally, when you are trout fishing in the warmer days, it’ll be the best line for trout fishing. 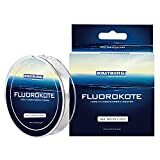 If you are a mono fan but looking for an alternative, or you want an alternative to the fluorocarbon because of the expensive price, the KastKing FluoroKote Fishing Line makes one hell of a choice. The P-Line Floroclear Clear Fishing Line is the best for knot strength. It’s a nice hybrid of nylon and fluorocarbon. If you don’t like brittle lines, and looking for a softer touch, the P-Line Floroclear lines will give you just that. Apart from its brute strength, it has a great castability. When it comes to fluorocarbon, you don’t want to go out and skimp on Fluorocarbon. Fluorocarbon, in my opinion, is the hardest line to get right. Buy a trusted brand. P-Line has made here is as tough as nails as the original CXS. Which I’m sure you guys know all about. Like most monofilament, it has low memory. Which means, it won’t curl up as much as a regular fluorocarbon will. It has a low stretch. If you don’t want to use it as a leader tied to braid, you can use it as the main line. It casts really well with a baitcaster or a spinning reel. No curly issues. It has a small diameter which makes it great for trout fishing. This is a good all-around line. Most people will use it for bass fishing. Because it works like a mono with all the characteristics of a fluorocarbon line. Not to mention at a reduced price. Great line if you don’t want to spend a lot of money for a 100% fluorocarbon lines. The Sunline Super FC Sniper Fluorocarbon is the most manageable line that works on both spinning and casting reels. To make such a versatile line Sunline uses what they call triple resin processing. This process along with the highest quality raw materials gives this line three characteristics that every angler looks for in a fluorocarbon line. High abrasion, resistance, low memory and most importantly a uniform diameter. All this means you don’t have to worry about knots, defects or thin spots when that big trout is on the line. If you’re a light line angler, you’re going to love the two and four-pound test. Fishing super clear waters for trout using drop shots or shaky heads then spool up with the six or seven-pound tests, you’ll be amazed at the strength and castability of these lines. 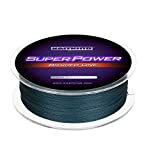 If you want a quality sinking line, check out the Sunline Super FC Sniper Fluorocarbon Fishing Line. Pick up the spool that best fits how you fish you will not be disappointed. Proudly Made in the USA. Stren is the line that you could count on. An all-American line that’s going to be there every time you use your fishing line. 100% Fluoro gives you dependability and strength. It is super-tough and abrasion resistant. It sinks faster than a mono and allows lures to run deep. It’s everything you would expect from a fluorocarbon and more. It offers good impact strength. For best performance, use it with an 8 or 10-pound braided line. It will serve as a good leader line for light tackle fishing. It has a small spool design which goes really well with a tackle box. Because it is 100% fluorocarbon, it goes virtually invisible under water. And the team at Stren formulated this line for maximum abrasion resistance. It will give fresh and saltwater anglers the upper hand in any fishing situation. This wraps out best fishing line for trout reviews. If you still prefer other lines, go ahead and read the rest of this guide. Mono is still widely used by many trout anglers. Because of its versatility, most new anglers start out with these lines. It’s also a sensible choice when you are budget conscious. These are cheap lines and often people will buy them just for that. These lines are a little bit more elastic. Don’t get confused but this property on a fishing line is also good. You know, sometimes when fish hits the line it might snap the line. This is where monofilaments will give a little bit and not break. That’s why the mono fishing line is used for fishing a variety of species. Another feature of these lines is that it sits on top of the water. But, that’s not the case with fluorocarbon. Fluorocarbon will sink. When is this good and when not? It depends on the bait, which is not the main topic of this article. But, for the sake of removing any doubts you might have, I’ll make this short. If you use topwater baits you need to have monofilament line. Otherwise, use fluorocarbon. Because this line stretches, you need to keep an eye on your reel’s drag setting. It might snap if not carefully used. Another problem with this line is its high memory. If left unused for too long, it will curl up on a spinning reel, which may also lead to cast failure. One common mistake most trout anglers make is that they pick the bright colors. That’s a mistake that’s going to cost you. Stay away from them. I know what you are thinking right now. Who in the right mind would use braided lines? My thoughts exactly! Certainly, no one in clear water but they are still the number one choice for spinning reels. If you are lure fishing for trout or bait fishing, you need to use them as your main line. There is a trick to saving cost while not compromising your catch rate. A lot of anglers use braided lines as their main line and pick either mono or fluorocarbon as their leader line. This saves a lot of money rather than using the whole fluorocarbon line as the main line. It has the same thickness as the mono but much stronger. You have the option to choose a stronger rated line without added thickness. Zero stretch and thinner profile allow it to cut through water faster. You can feel the biting much better and gives you harder hooks. Its low memory makes it very suitable for using them with spinning reels. It is rot resistant and lasts longer than other fishing lines. However, it’s not recommended to be used as a leader line because it is more visible than any other fishing lines available for trout. This is probably its biggest drawback. It has literally no virtual transparency. Trout won’t even come near them. Trout are easily spooked. Especially if you are planning to catch brown trout, they are the shiest as trout get. There is a way to use them but you need to have a long leader line. If you use a short rod with long leader line with a braided line as your main line, you will have trouble with your casting accuracy. The only way to get through this problem is to pair it with a good quality fluorocarbon leader. Accuracy won’t be perfect but you will still be able to hook trout without spooking them. When you are out for trout fishing, this isn’t something that you would normally come across. Lead core is meant to be used for trolling only. If you are trolling on deep lakes, these lines will surely come in handy. Why is it called lead core? Because it has a core running through it. This adds weight to this line. If you have read our trout lure buying guide then you’ll know that spoons and rapalas are very lightweight. The extra weight on these lines helps the lures get down deeper than they normally go without using any expensive down-rigger setup. If you are not an expert angler, my piece of advice for you is to avoid them. Lead core is used to measure line length without using any line counter reel. These lines change color every 10 yards or so. If you use a good fish finder, you can easily find out how deep your trout lures will go. Want to hook some big trout? Only by getting down to these deeper areas of the lake is how you are going to hook one. By now, you already which type will be best one. But, there are some other key factors that you should consider before buying a trout fishing line. For a perfect trout fishing setup, you need to choose the right line weight. It’s laid on the box. The smaller the number the less it’s going to be able to take. So, a 2 lb. line is going to break just like that but it’s also going to be very thin. So, on days where it’s crystal clear on the water or maybe the water is really low and trout are going to see the line, a 2 lb. line should be a good choice. It’s better to stick with a 4 – 6 lb. fluorocarbon line. That way if a bigger trout bites the bait, it won’t break the line. In short, it depends on where you are fishing and how big the trout might be. If you are going to use a monofilament line, the most you can get away without spooking trout is to use 2 – 4 lb. test. This is where fluorocarbon shines the most. You can easily set your reel up to 6 – 10 lbs test. This way you can bring some good size fish without breaking any line. Rainbow Trout: These are the most fished trout in the United States. They are native to the western slopes of Sierra Nevada Range. But, you can find them is rivers and lakes all over the US. These are excellent fighters and known to jump when hooked. Monofilament will be a good option for catching rainbow trout. You can also use a fluorocarbon line with 4 – 6 lbs test. Brook Trout: You can distinguish them by their white leading edge and black lower fins. They don’t normally grow bigger than 8”. Any fishing line will do as long as it is invisible under water. Hey, trout are line shy. Keep that in mind. You can find Brook Trout aka speckled trout in the colder water. They are not usually stocked. Brown Trout: The most suspicious and hard to catch trout. They are not native to the US. These are sea trout and only return to freshwater when they spawn. Originating from Western Europe, these trout can grow up to 44 lbs and 39”. Make sure you bring some heavy lbs test lines. Most of them are going to around 2 lbs. You can spot them by their black, red and orange spots on their sides. Fluorocarbon or copolymer is a must if you want to reel in brown trout. If you want to hook in some big trout, the best time of the year is late spring. Normally, you can fish them throughout the year. Only the big ones can be found late spring. In early winter, most lakes and rivers get stocked with trout. Trout are most active in waters where temperature ranges from 39 – 67 °F. Also, it’s better to fish for trout on cloudy days. Trout eyes can stand up to intense light. If there is no cloud, try to fish under the shade of a tree or right before the sun goes down. Simply putting everything together, fluorocarbon lines are crystal clear; trout are line shy and get the right lbs test line. We hope this guide will help you find the best fishing line for trout so that you can catch some big trout this year. Also, if you have tried out other trout fishing lines, do share your experience in the comments below.